These are examples of products that can be custom made to your liking. If you are interested in a particular product, send me a message. While I may not have the same fabric from the photos, I love sourcing fabrics that suit a wide range of tastes and styles. Color & pattern vary by batch. Custom orders welcome. Set of 4, unless otherwise requested. These placemats are a contemporary take on a traditional form. A vivid stripe of pattern intersects a solid panel of color giving them a modern flare. They are quilted with clean lines and are sewn with a layer of batting for softness and absorbency. Placemats are approximately 14.5 x 12 inches. Set your table so that each placemat matches or alternate place settings for a more vibrant look. These placemats & full size napkins make a great pair. Mix and match every time you set the table for a variety of looks. 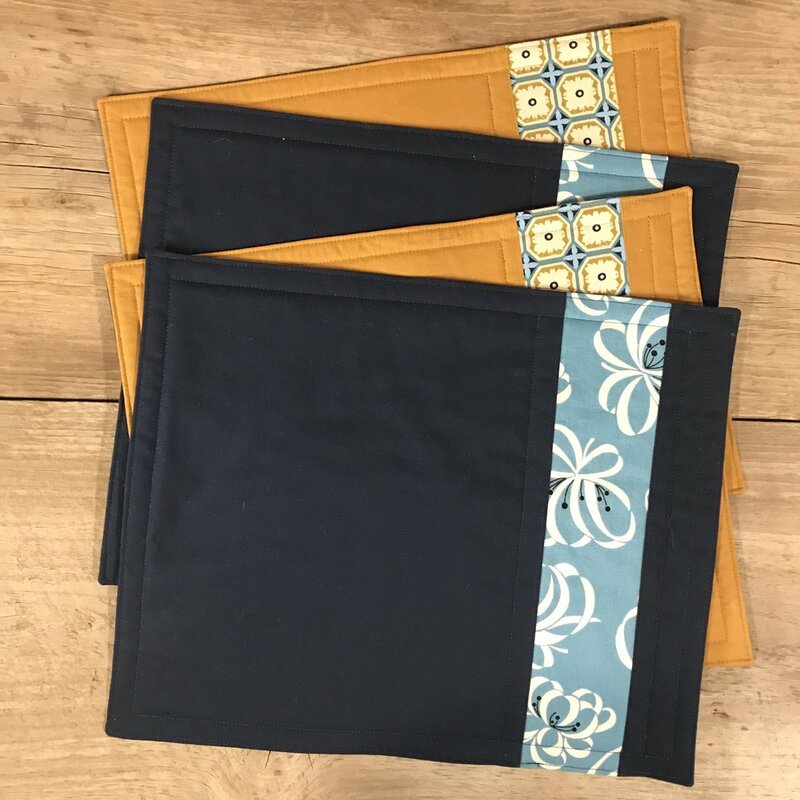 Set of 4 placemats & 4 full size napkins, unless otherwise requested. Add a splash of color in your kitchen with these flour sack kitchen towel. Each towel is edged with trimmings from The Violet Orange and is one of a kind. Flour sack towels dry quickly and are lint free. Each towel is approximately 27 x 17 inches. They also have a nifty little loop sewn across the back corner to hang on a kitchen hook. Flour sacks are made from upcycled bags originally used to transport flour, so slight imperfections add a touch of character. 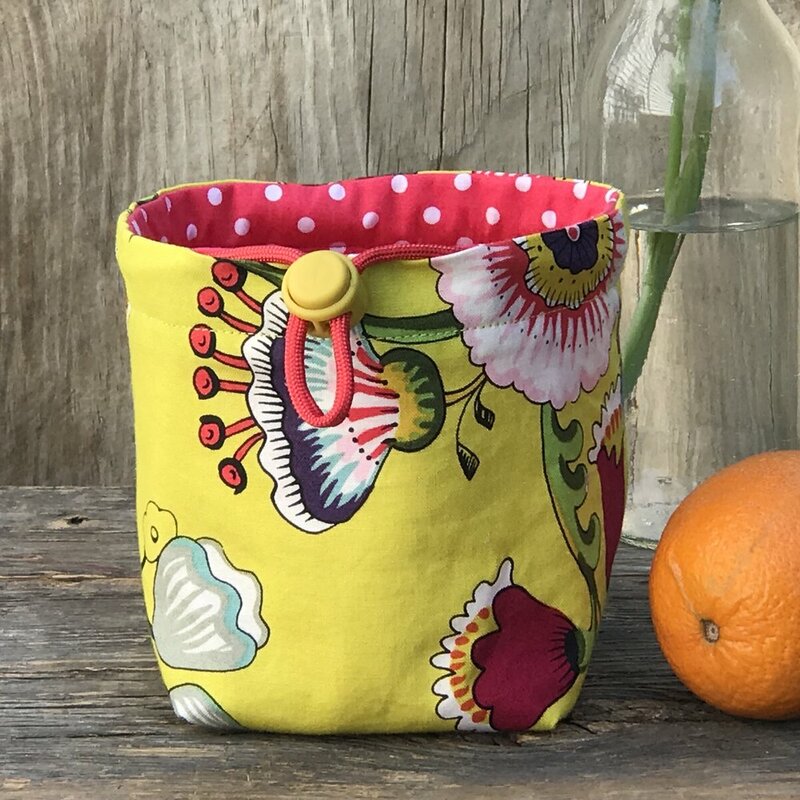 Small drawstring bags are perfect to keep all sorts of small treasures. Bags close with a spring loaded cord lock. Each bag is approximately 3 inches tall and 7 inches wide. 100% cotton and polyester interfacing & cord with a coordinating cord lock. Fabric is pre-washed for easy care. 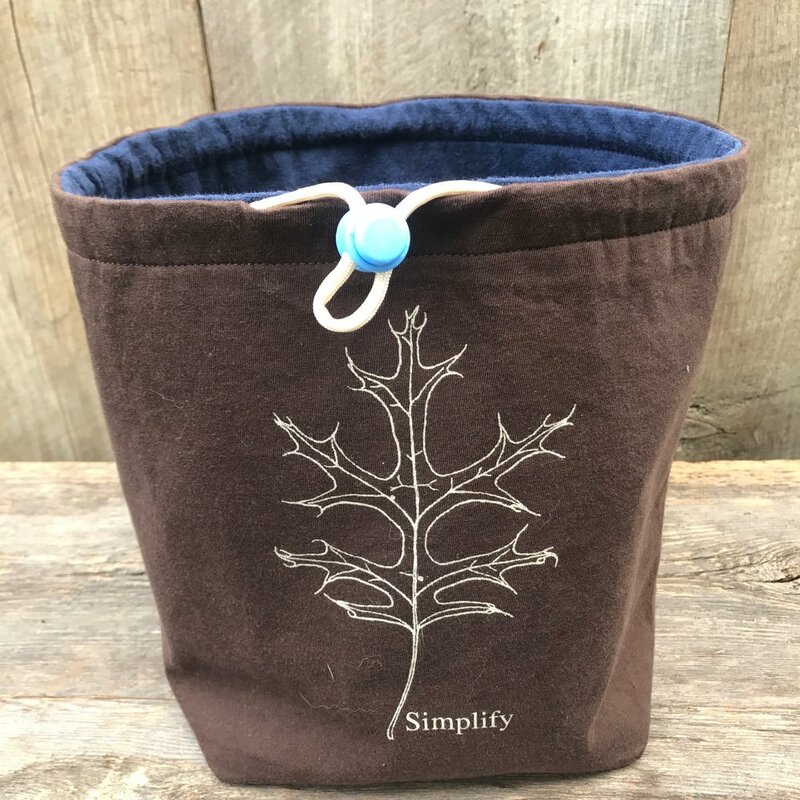 This midsized drawstring bag is great for carrying a knitting project. It can accommodate an adult sized sweater, needles, extra yarn, and other accessories easily. Not a knitter? No problem! They are great for camping odds & ends, a quick change of clothes, small toys, snacks, art supplies, or anything else you can dream up. Bags close with a spring loaded cord lock. Each bag is approximately 7 inches tall and 10.5 inches wide. Upcycled bags are made from vintage t-shirts! Each bag is one-of-a-kind. In order to accommodate the designs on some shirts, the bags vary in size. Have an old t-shirt you love so much you want to keep it forever, but don't want to be seen wearing it in public? Send me a message and I'd be happy to help you give it a new life. All upcycled bags are one-of-a-kind. 100% pre-washed upcycled t-shirts, polyester interfacing & cord with a coordinating cord lock. 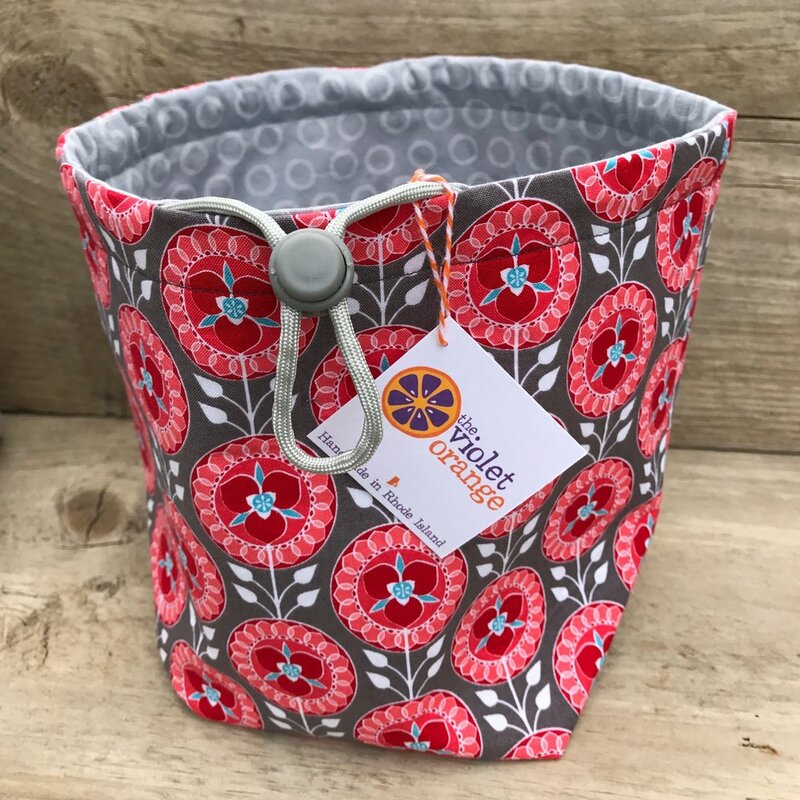 Looking for a bag to bring to the market, hold toys and books in the car, or haul your crafting needs? This is the one. Sewn with two large contrasting pockets, one on the outside and another on the inside using the opposite fabric. Totes are approximately 16.5 inches wide and 16 inches tall. 100% cotton and polyester interfacing. Fabric is pre-washed for easy care. Machine wash and tumble dry on low or air dry. Iron as necessary. A great gift idea for yourself or your favorite foodie friend. Each apron has a single pocket and extra long sash that allows you to either tie a large bow in back or a small knot in the front. Half aprons are approximately 21 inches wide x 21 inches long. The sash is approximately 92 inches long. Reversible infinity scarves are deliciously soft and made from two coordinating knit fabrics. Scarves can be worn to show one side or both sides at the same time. Loop two or three times depending on your desired look. Scarves create an approximately 68 inches long by 9 inches wide loop. When flat, they are approximately 34 inches long (half the length of the full loop). Color & pattern vary by batch. Unisex options available. Custom orders welcome. Knit cotton & spandex. Pre-washed for easy care. Machine wash on gentle and tumble dry on low or air dry. This gorgeous twine is hand spun with trimmings from The Violet Orange. Use it to wrap presents, knit something fantastically whimsical, or sew coasters, rugs, or bowls. To keep the integrity of the twine, tie a knot in it before cutting. Each spool holds approximately 11.5 yards of twine made from 100% cotton fabric trimmings. *UPCYCLED NOTE: All products in my shop that are upcycled are made from once loved t-shirts. I do not represent any of the artists on these trademarked shirts. Images are copyright of their respective owners. I am simply upcycling to create a new and unique item from an old piece that was no longer in use.